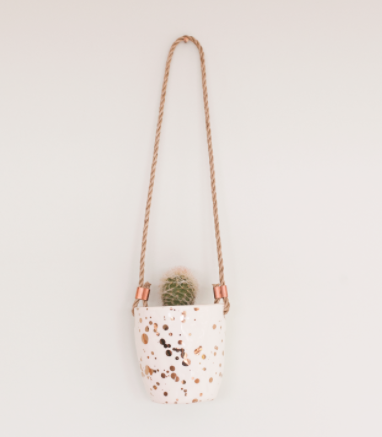 Hang your favourite plant in this handmade ceramic planter. Finished with gold metallic splatter and gloss glaze. Add a handful of small pebbles in the base followed by soil and a small hardy plant. Suitable for indoor and outdoor use. Being handmade natural variations will occur. Presented in a cotton drawstring bag. Plant in pic not included.